Method of preparation and use: One tablespoon of the raw pour into 200 ml of water, boil 15 minutes, then pour boiling water to the original volume and filter. Administer per orally 50 ml 3-times a day after meals; also it can to be used to rinse mouth and as an inhalation. 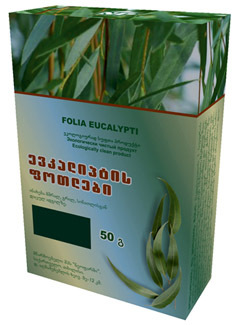 Eucalyptus leaves tincture is used as an auxiliary antiseptic and anti-inflammatory remedy for the upper respiratory tract diseases.